The linguistic devices expressing antithesis consist of many forms. In our example it is far from … actually … .The more usual expression, not … but …, has not been found in our corpus as expressing antithesis; instead, we find: not X Y; not X Rather Y; X Such is the silliness … Y. Objections are far more frequently used in our corpus (I would write the percentage here four-five times more than antitheses). Theire linguistic expressions are: This objection is unpersuasive; One objection centers on …; A second objection is that …; It simply distorts reality; I reject the proposition; This argument, however, denies the simple truth that …; Again, this is not the case; But that simply is not true; In response, I would first note that … . 2. Although many of my liberal and progressive comrades view affirmative action as a redistributive measure whose time is over or whose life is no longer worth preserving, I question their view because of the persistence of black social miser, the warranted suspicion that goodwill and fair judgment among the powerful doe not loom as large toward women and people of color (p. 86). It is worthwhile to remark the concession appearance of (2) (‘Although … ‘). But according to our definitions of counter-argument refutation and objection as a kind of denial, the fact that the utterance starts with a syntactically concession clause cannot by itself exclude it from being an objection. The concessivity in this utterance does not concern the proposition relevant to the counterargument, but only the matrix sentence ‘many of my liberal and progressive comrades view … ‘. This proposition is indeed accepted as true, but not the embedded one, which says that the time of affirmative action is over. 4. Race is proposed as merit based on the value of the perspective that each racial minority brings to the admitting institution. But perspective may not correspond with race (283). The second sentence is in fact a reason for not accepting the preceding proposition. This function of the but-sentence is perfectly understandable, since, according to Anscombre and Ducrot 1997, a but-sentence always orients toward the opposite orientation of its preceding adversative sentence, and in our case it serves as a reason (i. e., an argument,) for rejecting the preceding sentence. 5. Although affirmative action sounds like a natural way to tackle the problems many Latinos experience in D.C. and other cities, it’s a very rough stick to use on a very complex problem (p. 175). 6. It is against that legacy that one reads, with overwhelming sadness, Sheryl McCarthy’s ‘defense’ of Moses: ‘Why is it that the only time everybody talks about standards is when women or people of color are trying to advance or be heard? Mediocrity is a common characteristic of white male academics, . . . Let’s hire women and people of color who are as ordinary as the white males who already dominate academia, and there will be no trouble in keeping up current standards. No trouble at all’ (p. 317). ‘with overwhelming sadness’ is the only hint revealing the writer’s personal opinion. 7. Although affirmative action has primarily benefited the black middle class, that is no reason to condemn preferential treatment (p. 54). The second part of this concession sentence rejects directly a conclusion which is assumed by the opponents of affirmative action to follow from the first part. The lack of the direct-rejection concession can be explained by the unwillingness of the writers to be too blunt in their argumentation. Writers within an academic discourse community, as well as readers, value politeness and tend to express solidarity (Barton 1995: 234. Rejection of a conclusion in an open and direct way, which other members of the community consider to be a legitimate conclusion of an accepted premise is counter to those values. On the other hand, the subtype of concession, the indirect-rejection concession, is by far the most frequent counter-argument refutation, and suits very well the request of politeness and solidarity. 8. Many whites and some blacks now argue that preferential racial treatment creates deep-seated feelings of deficiency and mediocrity in its beneficiaries. They warn that race-conscious practices, in hiring or education, cast suspicious on the competence of those given an advantage. But if that is so, we need the new Civil Right Act more than ever, to overcome the sense of inferiority that has afflicted American white men for year. Think of it. For decades, white men have known they’ve received favored, front-on-the-line positions in jobs, education, and the benefits of race-conscious society (p. 126). The peculiarity and astuteness of this direct-rejection concession lies in the second part of the concession: the writer takes the counterargument and uses it, ironically, as a pro-argument. Concession is above all the antidote to lack of moderation; it expresses the fact that one gives a favorable reception to some of the opponent’s real or presumed arguments. By restricting his claim, by giving up certain theses or arguments, a speaker can strengthen his position and make it easier to defend, while at the same time he exhibits his sense of fair play and his objectivity (p. 488). And he adds: Each time a speaker follows the interlocutor onto his own ground he makes a concession to him, but one which may be full of traps (p. 489). A. Concessive expressions introducing the first part of a concession relation: Of course; In theory; certainly; Despite; So yes; Although; While; It may be that; Of course; Naturally; Admittedly; Even if; Many argue that …; Some critics might argue that …; The objection is that …; It assumes that …; It seemed that …; I concede that …; One objection centers on …; They argue that …; It may be countered that …; The opponents of … say …; According to …; The argument against is …; Among the attractions of this theory are … . B. Contrastive expressions introducing the second part: But; Yet; However; On the other hand; One problem with this approach is …; In response, I would first note that. 9.There would be fewer blacks at Harvard and Yale; but they would all be fully competitive with the whites who were there (p. 206). 11. They (the proponents of affirmative action – M.A.) know that not all of their opponents are racist; they also know that many of them are (p. 66). 12. The critics of affirmative action piously proclaim that the goal of civil rights should be a ‘color-blind society’ that rewards people solely on the basis of individual merit … . Who can be against that? What the critics don’t like to talk about is the fundamental success of affirmative action, visible in large and small towns across the country (p. 183f). In the second part of the concession, there is no reference to ‘the goal of civil right’, to ‘civil rights’, or to ‘color-blind society’, which could have served as shared topic of the two parts of the concession. 13. The opponents of affirmative action program say they are opposing the rank unfairness of preferential treatment. But there was not great hue and cry when colleges were candid about wanting to have geographic diversity, perhaps giving the kid from Montana an edge. There has been no national outcry when legacy applicants whose transcripts were supplemented by Dad’s alumni status – and cash contributions to the college – were admitted over more qualified comers (p. 212f). The writer acknowledges that rank unfairness is indeed caused by preferential treatment, but, nevertheless, he or she does not accept the opponents’ conclusion. Instead, he or she puts forward a pro-argument, saying that rank unfairness caused by all sorts of preferential treatment was always a fact of life, and nobody cared. This implies an accepted double standard attitude on the part of the opponents of affirmative action, and it also implies a refutation of the opponents’ standpoint. To close this short presentation, it is important to point out that all the above counter-arguments were actual counter-arguments, which had been used by real opponents to support their standpoint and no prolepsis, i. e., anticipatory refutation in the form of a concession, was found. A prolepsis may be in the form of a direct-rejection concession, not an indirect-rejection concession, since this is, by definition, a reason serving as a pro-argument, and a prolepsis, as a figure of speech, gains its persuasive force not by reason, but by psychological manipulation (See Robrieu, 1993). The lack of prolepsis, which can also explain the rarity of the direct-rejection concession in our corpus, is another indication that the argumentation tools used in our collection of essays are similar to those used in regular academic-discourse community. Contrast is crucial to many aspects of academic argumentation, especially as a basis for creating knowledge via argumentation (Hunston 1993). It would seem that counter-argument refutation is necessary in establishing differences between proposed and opposed claims in research articles, as well as in debating political and social controversies. 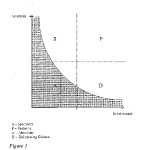 Anscombre, J-C. and Ducrot, O. (1977). Deux mais en français?, Lingua 43, 23-40. Azar, M. (1997). 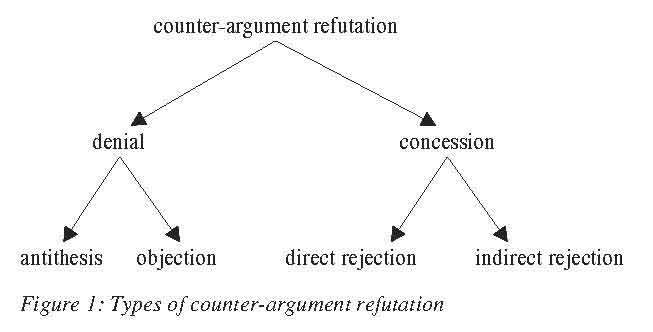 Concession relations as argumentation. Text 17, 301-316. Barton, E. L. (1993). Evidentials, argumentation, and epistemological stance. College English 55, 745-769. Barton, E. L. (1995). Contrastive and non-contrastive connectives metadiscourse functions in argumentation. Written Communication 12, 219-239. Hunston, S. (1993). Professional conflict: Disagreement in academic discourse. In: M. Baker, G. Francis & E. Tognini-Bonelli (eds. ), Text and Technology: In honor of John Sinclair (pp. 115-134). Amsterdam: John Benjamins. Peck MacDonald, S. (1987). Problem definition in academic writing. College English 49, 315-331. Perelman, CH. and L. Olbrecht-Tyteca (1969). The New Rhetoric: A Treatise on Argumentation, Notre-Dame: University of Notre-Dame Press. Robrieux, J-J. (1993). Éléments de rhétorique et d’argumentation. Paris: Dunod.